One automotive genre that was very popular in the '70s, that has completely gone out of style today is the 2 door personal luxury coupe -- a car subgroup with more emphasis on style than speed. 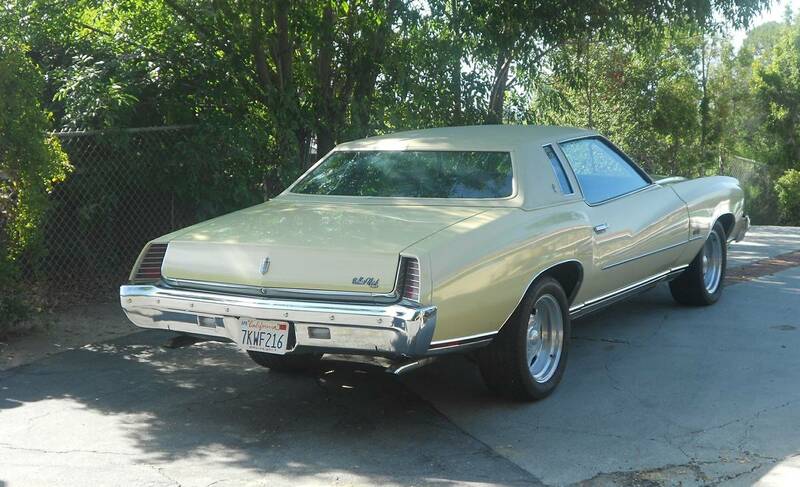 Nothing says personal luxury couple like this 1973 Monte Carlo Big Block for sale for $8200 in Covina, CA. This post is part of DT's 2016 Birthday Celebration of 100 cars; enjoy the ride! 8200 bucks is a lot of money but this Monte Carlo is very presentable on the outside, inside, and under the hood. 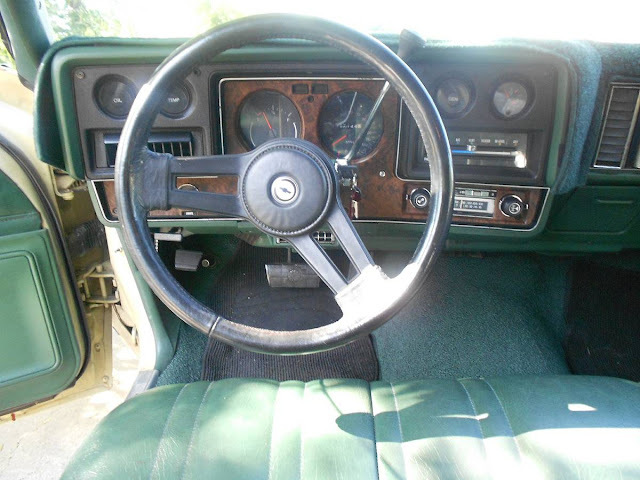 The owner infers the martian green color is original, with one repaint. The body panels fit well, no rust is evident, and even the ½ vinyl top looks presentable. All the bright work, bumpers and grille are in great shape. This car has the round headlights that are a little less common than the stacked square lights that came later. The car has what look like circa 1995 Centerlines on it. They don't quite work but they are easy to change, and will probably be back in style before you know it. Things look just as good under the hood. 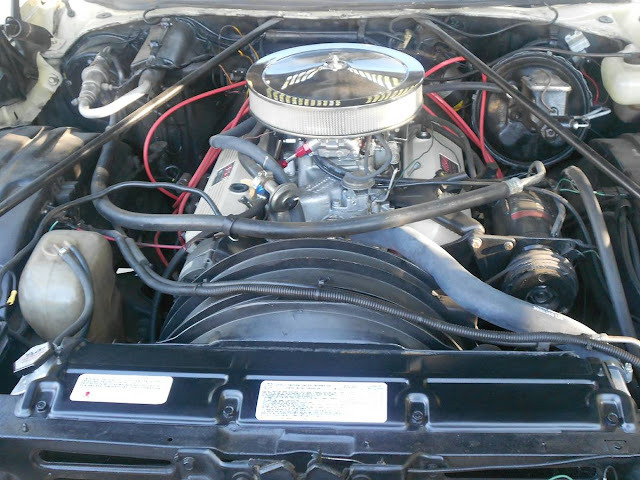 You can see a later big block under the hoses and lines in the engine compartment. The owner doesn’t mention if the AC works, but from the looks of the car, I would guess they do. Everything is nice and orderly under the hood which would seem to imply that the car has been well cared for. Good vibes continue on the inside. Everything looks nice and neat. While not my cup of tea, the dark green vinyl works with the light pea green on the outside in a very 1973 sort of way. Oh Jeebus, the bumper years. The Monte Carlo was moderately attractive before this, but with 1973 came the apocalypse for most of Detroit. Though I will admit that as far as I'm concerned the 1973 Corvette, with the soft nose and the chrome rear bumperettes, was the best-looking of all the C3s. 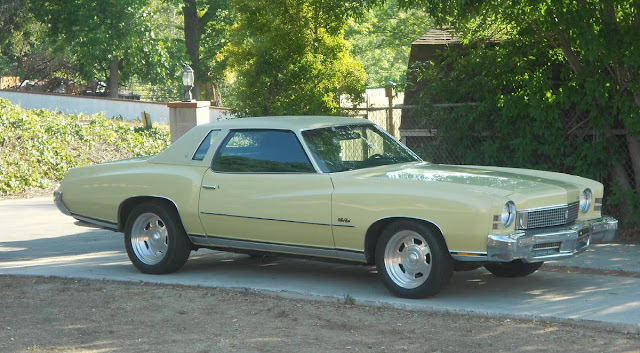 The 1973 standard was 'one 5mph impact in front, one 2.5mph impact in back' and the '73 Vette got away with having a bumper on stretchy bolts in front, so after one impact it was shot. Had to redo it for '74, when the Feds wanted to keep bashing the car at 5mph forever.